For readers of Drive, Outliers, and Daring Greatly, a counterintuitive, paradigm-shifting new take on what makes people and companies succeed. Most new products fail. So do most small businesses. And most of us, if we are honest, have experienced a major setback in our personal or professional lives. So what determines who will bounce back and follow up with a home run? 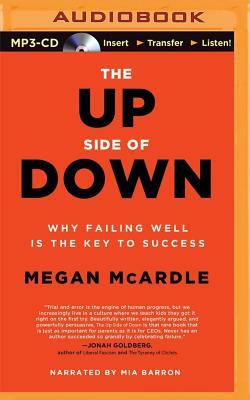 If you want to succeed in business and in life, Megan McArdle argues in this hugely thought-provoking audiobook, you have to learn how to harness the power of failure. McArdle has been one of our most popular business bloggers for more than a decade, covering the rise and fall of some the world''s top companies and challenging us to think differently about how we live, learn, and work. Drawing on cutting-edge research in science, psychology, economics, and business, and taking insights from turnaround experts, emergency room doctors, venture capitalists, child psychologists, bankruptcy judges, and mountaineers, McArdle argues that America is unique in its willingness to let people and companies fail, but also in its determination to let them pick up after the fall. Failure is how people and businesses learn. So how do you reinvent yourself when you are down? Dynamic and punchy, McArdle teaches us how to recognize mistakes early to channel setbacks into future success. The Up Side of Down marks the emergence of an author with her thumb on the pulse whose audiobook just might change the way you lead your life.